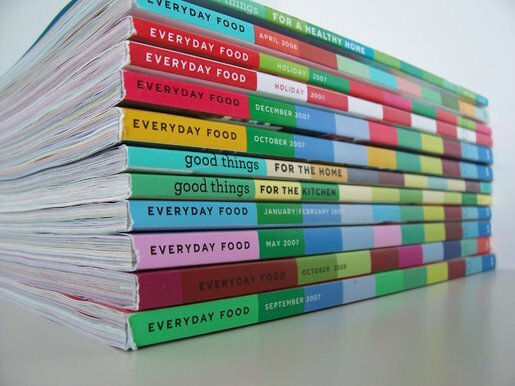 I only recently started collecting Everyday Food magazine and have picked up a few of the special "Good Things" issues on the newsstands - the ones that pertain to the home. I keep these in the kitchen on a white shelf, simply stacked, one on top of the other. I like the graphic effect of the striped spines against the stark white lacquer and they're very easy to reach for. I don't often tear out the little recipe cards contained in the magazine, but I have done it a few times. I don't generally cook from the magazine, to be honest. 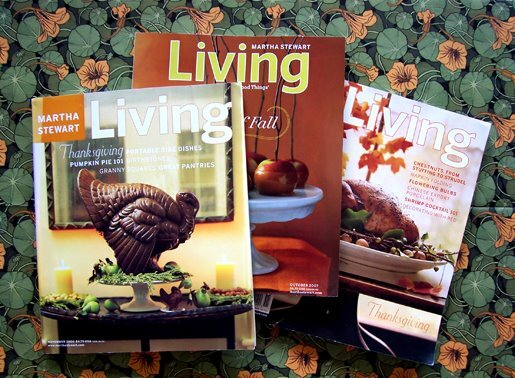 I read it for other reasons, primarily decorating, organizing, design and graphic inspiration and gardening. But there are a few recipes that have warranted clipping them out. 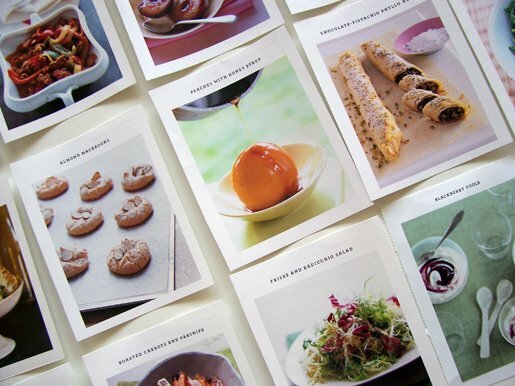 I keep them all in a recipe box with a few torn-out pages from Everyday Food containing recipes I use frequently. I tend to make the side dishes and desserts most. Feel free to share your own 'Living' habits with me! UPDATE: A reader suggested I turn around my magazine holders to show off the spines of the magazine. I took the advice and like it much better! Very nice set of magazine holders Andrew! Might I ask where you bought them? Quite impressive. I fall into the "seasonal" organization, mainly because if I ever finish the monthly issue before the next month arrives, I can always have more MSL (for that month) from prior years. The seasonality (recipes) is another reason I store mine this way. Terrific collection you have there! Thanks so much for sharing it with us. Wow, so organized! It's always fun to go back and see how much the issue (and her hairstyles!) have changed over the years. As my five-year-old son would say, "Good times, good times." I keep mine for a year and then pass them on to my Mother In Law, Sister in Law and then from there. I donate to the local Library. Sharing Martha with the masses.....that is the way it should be! The magazine holders were bought at Ikea. They're $2.99 each but their very sturdy with nice metalic accents. I like your idea of giving them away after each year, Carolyn. I will start doing that after this year, I think. Having ten complete years is enough for me. Thank you for your continued comments, guys! I use to tear out the articles and recipes I liked and would slip them into sheet protectors, then put them in binders. I love your way of living with your collection.You have a very clean style.I have every issue before 2002.After that I have usually check the issue at the magazine rack to see if its worth purchasing.However I ALWAYS by Septembers!I organize mine in a rather boring way.Issue 1 through the current.I find its the easiest way to locate the issue I'm looking for.I also purchase several copies of an issue that really appeals to me.I have the MSL index but every issue since 2000 is not listed.I will have to send you photos sometime.Also my extensive collection on vhs.I have 50 or so recorded and 30 purchased Martha Stewart Living videos.My method of converted episodes to dvd is much more organized.I have it in a binder and on my computer.If my house was on fire and I could save 1 thing it would be my homemade Martha dvds! I have my issues arranged in numerical order. I do have every issue of Living and to my knowledge every special issue as well, however I do keep those in their own magazine organizer. I have just moved and once I unpack i will post pictures of my collection on my blog. Great tip on your organization of the everyday foods! 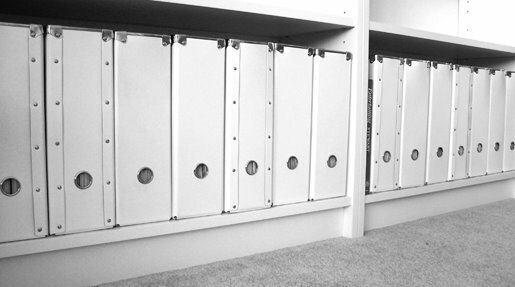 do you have a specific rack for them? Ali, I used to buy an extra copy of Living just so I could tear out the beautiful photos and put them on inspirational bulletin boards. I haven't done that in a while, but I may. I always like to have at least one clean copy of each issue, though. Joseph, I organize the magazines as you do! I would love to see your DVD collection sometime! If you can, send me a list of the VHS copies you have. I must admit that I'm less knowledgable about Martha's TV ventures than I am about her publishing projects. I have to admit that I'm relieved to learn that others also take seriously the task of organizing and archiving Martha's publications! :) In a walk-in closet, I have an overhead shelf that houses several magazine holders (not unlike yours, Andrew! Mine are the linen version from Martha By Mail). They are organized chronologically. 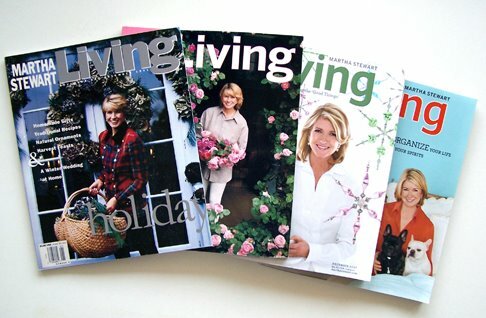 Separate magazine holders houses the full run of Martha By Mail/Catalog for Living; the full run of "Blueprint"; and selections of "Martha Stewart Kids", the Special Issues, and "Body & Soul". I have outfitted several bookcloth binders with clear sheet protectors that contain various pieces of Martha ephemera - book offers from M's former collaboration with Oxmoor House, Good Things booklets, even a few examples of packaging from M's various product lines from years past. On my list of spring projects is to install an additional shelf (I'm running out of room!) As always, thanks for sharing, Andrew! Wow, you're all very organized! I store my issues in the bottom of my food closet. They are just randomly thrown in there, along with my cookbooks, and back issues of other magazines of interest to me. Needless to say, this method of storage is not a good thing! It's very hard on the magazines, some of which have become collector's items. Thanks for telling us about the IKEA magazine holders, Andrew. I will definitely buy those, as it will also make looking for particular issues much easier. I also collect MSL on VHS and DVD.I buy them wherever I can, and have paid a handsome price for a couple of them! However, I am always looking for reasonably priced VHS of her old living tv shows. Not the specials, but the ones from the early 90's. The videos made of them were distributed by Time Warner, I think. Anyway, it has been fun being a Martha collector,and I hope to someday pass on my collection to my two daughters. My collection is shoved under the bed, in the closet and stacked up in the corner of my bedroom but I can find any article I need. I used to leave work to get home and make VHS of Martha's show and have them all junbled up with other tapes I thought I should record. I quit subscribing to MSL long ago and pick up copies that are given away and add to 'collection'. You have a wonderful organized set and I do admire it. I keep my Living issues in magazine holders, albeit less fancy and cute as yours. I do break my magazines up by season. I love keeping them that way because my collection is a bit more sporadic since I couldn't always afford the subscription when I was younger. It's great being able to go to my shelf and pull out all the spring or summer issues at once to look over for ideas. It is especially helpful with the holiday issues. I keep my Everyday Food magazines on a shelf in my dining nook, in issue order. And I have about a year's worth of Wedding issues from when I was engaged. I got rid of almost all my wedding magazines, but couldn't part with Martha's. Thanks for the comments, Anonymous! 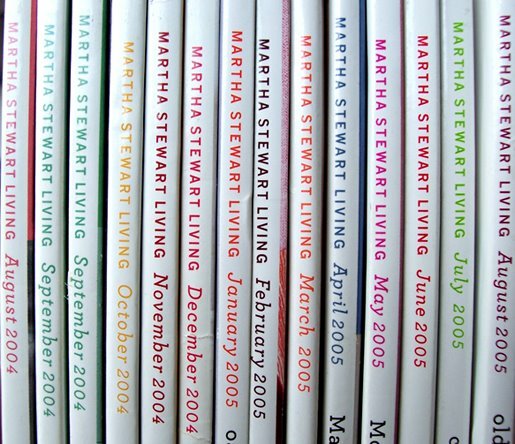 People use their magazines in different ways, which is why I thought it would be fun to discuss how Martha's magazine is kept in various homes. My friend Rick subscribes to her magazine but he has no wish to save the issues. 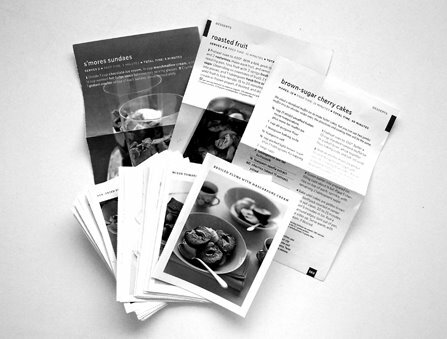 He rips out the photos he likes, tears out the recipes and then recycles the rest. If you want to preserve them for your daughters, though, you should keep them in magazine holders where they won't get torn or folded. Keep them in a dry place out of direct sunlight so they won't warp or fade. I have a really large binder, "The Idea Book." I cut out the recipes, tips, craft ideas, & pictures that inspire me and put them in the book under the appropriate divider. I recycle the rest. This has been really helpful. I can bring the binder with me to a store when I'm looking for a similar piece of furniture, or ingredients for a recipe. I adore your blog! Excellent work! I to love the idea book.I have one with the redecorating turkey hill 1999 issue.I bought 5 copies of this issue but I look at the photographs all the time.if i'm watching television or talking on the phone I will just study the photographs.So I laminated those issues.I also collected alot of older magazines that had features on Martha prior to establishing MSLO.House and garden from 1977,country living from 1978 (did you know Martha was the feature on the premiere issue of country living in 1978? )And Country home.I like these because the photographs show different angles of turkey hill.And it was when Martha was still married.I also have a people issue where there is a feature on her Andy assembling their party barn that was on turkey hill.But I look at this book EVERYDAY.Hence laminating it for posterity. I have all the issues. I store them chronogically. I did have them separated by season once, but I had trouble finding a particular issue using the index. If I want all the Halloween issues, for example, it is not that hard for me to pull them by year. I store mine in wooden IKEA magazine boxes (like Martha has in her craft armoire). They were less than $3 a piece. I do plan to paint them and I have metal label holders to attach to the spines, but I haven't done that yet. The oldest ones are in a two shelf bookcase in our bedroom and the overflow is in the guest bedroom. I love my Martha's, but I am so bummed when we moved I lost a lot of them. I'd love to know how I can get past issues. Each month I reread all the old ones for that month - its so fun i forget how much good content she had in those-especially the earlier ones. 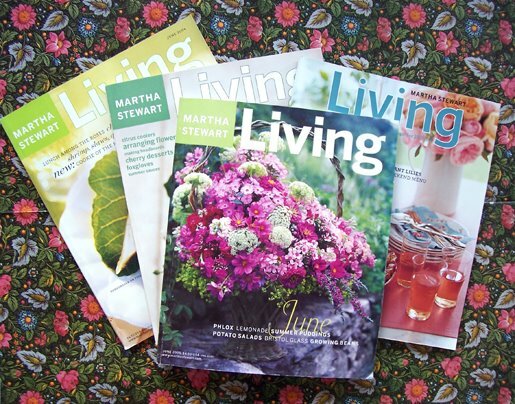 You can order back issues by calling the number at the front of Martha Stewart Living, or writing to the address provided. If you have the current issue, look at the page that lists all of the people who work at the magazine. At the bottom of that page you'll see a paragraph that tells you how to order back issues. I don't have the address or phone number handy at the moment, but it's easily found. Or, you can very often find locate past issues on eBay! Thanks Andrew!! PS - I love your blog!! Turn those cases around and show of the beautifully simple bindings! The close up photo of the bindings looks great, with all those great colors on the simple white - show it off! Now all you are displaying is your collection of $2.99 Ikea organizers. I admire your dedication. OH MY GOODNESS. You are my hero. I am in complete awe of this. Martha is my hero, and I am wondering if I could please feature this fantastic mag collection in my show 'Decor It Yourself' on Threadbanger.com? I would love to. You're fab, holla when you get a chance. 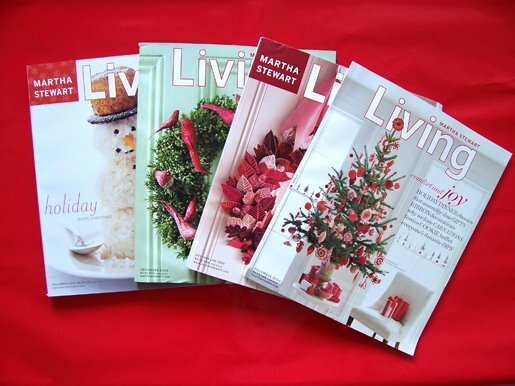 Love the idea about storing MSL magazines by season! That sounds so much easier than picking through the magazine shelf when I want to find Halloween recipes, etc. Thanks for the tip! Andrew - I have almost every issue including the premier issue (which I bought new when it was issued!!). I've organized my collection by year, then switched to seasons, and now they are by year again. I have many series of magazines, over 300 (and counting) cookbooks, and it's harder to save shelf space when organizing by season. I have some duplicates because of trying to fill gaps via eBay. I also have a large collection of home-taped VHSes from Martha's original series. I've been thinking of converting these VHS tapes to DVD which will save space, but some of the VHS tapes are pretty poor quality. Vicki, I to have over 20+ recorded episodes of the original half hour Martha Stewart living.Also the first season of the daily show.After that I only seldom record it because it was always a chef on from New York.But I suggest you do convert your vhs onto dvd.Some of mine the quality is so so.But Most episodes I have recorded 7 times.I recorded it when it aired then lifetime television replayed them a lot.I also bought several episodes on vhs.I have also converted her secrets of entertaning videos.But that way I feel I have preserved my collection.Plus its so much easier to watch and you can edit commercials.Alot of them were recorded while I was at high school so I could go back and edit.I was fortunate to have recorded all the Martha by mail spots and her visa small business commercial that she cut the old credit cards up to retile her floor.I'm so glad I did this.If I knew how to upload on youtube I would.But you should absolutely convert these! I organize them by month. All of the Octobers are together so when I want Halloween ideas, I can grab those easily. Also, I NEVER cut them up. I do cut up every other publication and have binder files for inspiration.